Installing a vinyl floor covering is a time-tested way to provide a durable and cost-effective base for any room. In general, vinyl is easy to put in, and the process doesn't take a lot of time (or a lot of labor). It has also come a long way in regard to its look. Though it has been used for years in commercial settings, vinyl wall covering is becoming popular for residential use as well. It brings the same durability that has been employed in schools, warehouses, and hospitals into the home, but with many different selections of color and style. A vinyl wall covering is a good choice for areas where a lot of traffic or wear is expected. When it gets dirty, it is easy to clean and can handle vigorous scrubbing. It can keep its original appearance for a very long time, and if damage does occur, it is not difficult to fix. Vinyl wall covering comes in three different grades. The light duty is tough enough to handle most residential situations. The heavy and extremely heavy duty varieties are more for industrial or commercial use, though they might be appropriate for a workroom or garage. There are a number of different styles and colors. In most cases, homeowners will be able to find a variety that will fit their needs and color scheme. Vinyl floor covering is most often available in a convenient tile form that is easy and inexpensive to install. Once again, there are enough color and pattern choices that any homeowner should be able to find a style to suit any home's needs. Vinyl floor coverings that look like natural materials are commonly available. They will give a room the look of stone or wood but will cost a lot less and, in the case of wood, will require less maintenance. These floors, though not waterproof, are considered water resistant and can be used in more moist areas, like laundry rooms and bathrooms. Vinyl is also considered a "resilient" floor covering, meaning that its surface will have a certain spring. This, to some extent, will protect falling objects from shattering. 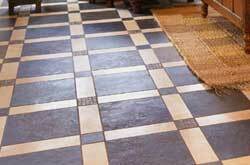 Vinyl flooring is also warmer and more comfortable underfoot than many natural materials. The high shine of a vinyl floor covering is easy to maintain. Some come with a clear top coating of either vinyl or polyurethane (the latter being more durable). To keep these floors shiny and new looking requires only sweeping, vacuuming, and an occasional damp (but not wet) mopping. If the vinyl doesn't come with a "no-wax" finish, it should be waxed periodically to keep its shine bright. Usually, once or twice a year is sufficient. When too much wax builds up, the floor can become discolored; the wax will, then, have to be stripped off and new wax should be applied. Jon Nunan is a freelance writer who draws on his experience in construction, ranging from landscaping to log home building, for his articles on home improvement. Your Floor Finish: First Place or Runner Up?